The Harty siblings in 1959. Left to right: Patricia Harty, brothers Henry (San Francisco), Martin (Tipperary), Desmond (San Francisco), the twins Michael (Tipperary) and Margaret (Toronto), and Noel (Waterford). One Christmas was so much like another in those years, to borrow a line from Dylan Thomas. My mother began the preparations in autumn. The plum pudding was stirred for good luck, then tied in gauze and seamed in a bowl on top of the our wood-burning Stanley stove. The big square Christmas cake, heavy with fruit, raisins sultanas, glace cherries, was baked until it was golden brown, and in the weeks ahead it would doused with whiskey to keep it moist. Closer to Christmas it was covered with almond paste, which required a lot of kneading and rolling to get to the right thickness. Two days later the white icing would be applied using a spoon to raise the icing into little peaks to give it a snow effect. One year, I remember mother made a snow house with cardboard and white icing that she used for decoration on top. I think that was the year that someone started eating the icing off the back side of the cake (I didn’t start it, but I did indulge), and so on Christmas morning we had a cake that was iced on three sides. I don’t remember mother being mad over this. 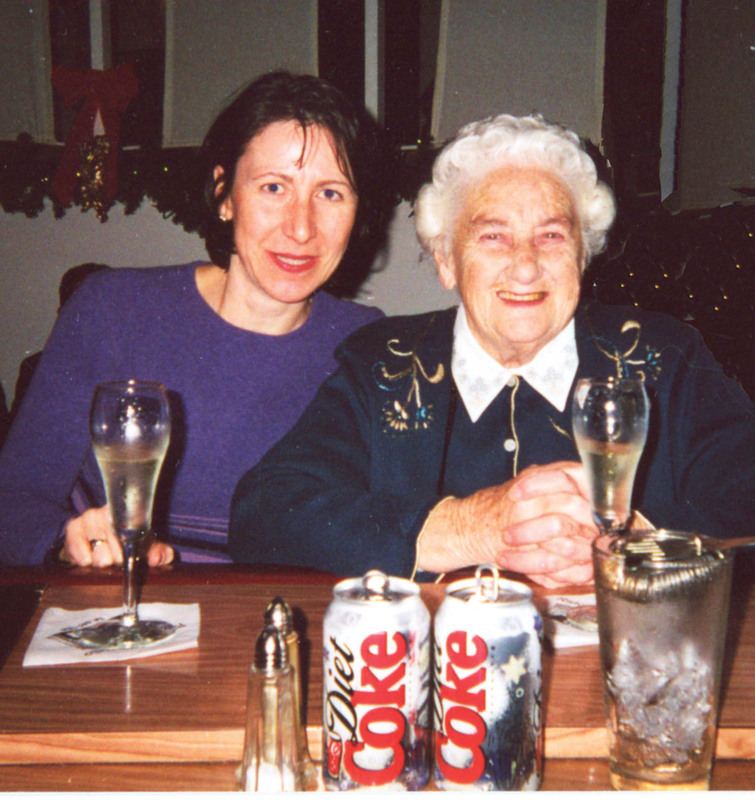 Mother Norrie Harty with her daughter Honora on New Year’s Eve, 1999, at Marcello’s San Francisco. Mother passed away on New Year’s Eve, 2008. In the weeks leading up to Christmas, anticipation would build. The annual letter was written to Santa, each of us got to name the present we wanted. Christmas cards would begin to arrive from relatives in America, England, and Australia, and from my mother’s friend Pat, in South Africa. Part of the Christmas ritual for us kids was the annual trip to Todds Department Store in Limerick city (30 miles away) for a photograph with Santa. Since it was the same Santa year after year, we had no trouble believing he was authentic. Midnight mass was another ritual. I can remember the crunch of feet on frosty gravel as we made our way to the car, and the bright stars in the dark country sky. Mass itself was a glorious production – the choir and the smell of incense all lending a sense of pageantry. Santa always came while we were at mass. The first thing to do when we got home was to put the baby Jesus in the crib. Then we were allowed to open our stockings, which usually held an orange, banana, chocolate and some little presents – once I got a yellow chicken that actually laid plastic eggs when you pressed it down. The big presents, under the tree, had to wait until morning to be opened. Christmas dinner (which was held in the middle of the day) was a feast. My mother would get up in early morning to put the large turkey in the oven. It would cook slowly and was basted on the hour until the skin was brown and crispy and the meat just fell off the bone. The table was laid in the good room we called the Drawing Room. There was a fire burning in the grate and a Christmas cracker at every place. Brussels sprouts and a carrot parsnip mix mashed with plenty of butter and roast potatoes as side dishes. Dessert was sherry trifle or plum pudding. It was magic. I loved your story. Brings back warm memories. What a wonderful clan you have. I had 6 brothers and no sisters. Only 2 brothers grew up with me though.. How I miss those days! The magic, the scents, the food and that wonderful feeling of anticipation! Thank you so much for your story. I’m second generation American but your memories, and mine, are almost identical. Merry Christmas to you, and your staff. I love this magazine!